Here’s one of the forgotten children of the anthocyanin family: Malvidin, the little champion that gives many food items their red to purplish color. 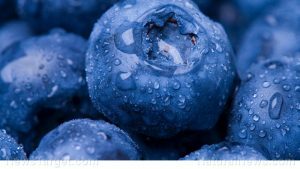 The flavonoid is found abundantly in such fruits as bilberry and blueberries and carries with it extremely powerful antioxidant properties. Nonetheless, unlike its other siblings, there is not much research on malvidin. When it was first discovered in 1938 by Hungarian biochemist Albert Szent-Györgyi, the compound was allocated as a mere food colorant. The therapeutic uses of the compound have only been analyzed recently. Due to this, a recommended daily allowance (RDA) has yet to be established. Malvidin works with its family to eliminate the damage caused by free radicals. In several investigations on the effects that flavonoids have on health, it was deduced that the synergistic qualities of the anthocyanins directly impacted the spectra of free radicals caused by oxidation. Consequently, malvidin is an efficient agent against tumor growth and progression. The anthocyanin was also observed (admittedly in conjunction with its other family members) to reduce the amount of free radical scavenging happening inside cells. One study saw that malvidin was particularly useful in the anti-proliferation of colon and liver cancer cells. A recent nutritional review likewise concluded that malvidin can reduce the risk of cardiovascular disease. The same mechanisms that protected the arteries was seen to be similarly exhibited among neural connections. This has led scientists to believe that malvidin can be used as a potential preventive agent against cognitive impairment. Malvidin was noted to inhibit photoaging in UV-B-irradiated human dermal fibroblasts. While the effects were not limited to just malvidin (scientists used a whole array of anthocyanins), regular intake of malvidin-rich foods can impede the growth of skin carcinoma caused by intense ultraviolet light radiation. Take note that these medical indications still need to be further evaluated. Doctors have not yet fully determined malvidin’s exact uses and functions. Malvidin supports the entire immune system. It is an effective agent against free radical damage and ensures that all body organs function properly. As such, it can be taken as a means to prevent cancer. Malvidin is a member of the anthocyanin family but has not been extensively studied. It is presumed that its medicinal effects are similar to that of its siblings, namely as a potent antioxidant.